It’s been a while since I’ve done a product review and I’ve been meaning to do one for ages. Recently, I’ve discovered the importance of Vitamin C in my skincare routine. If Vitamin C isn’t a part of your skincare routine, you are missing out. Vitamin C products were the most searched for products in 2017 according to The Telegraph . Vitamin C brightens and smooths skin. In addition to providing the skin with a more youthful appearance, Vitamin C has also been credited with removing dark spots and discolorations on the skin. Superdrug claim that their Vitamin C Booster will detoxify your skin and leave it softer and brighter than before. I definitely noticed a difference in my complexion after a few days. Was it significant? No, but I liked that my skin looked more radiant. My skin did also feel softer after a couple of applications. I never apply serums on my skin without my moisturiser as I feel that’s how they work best. If you want radiant skin without having to wait, I would definitely recommend this product. At £4.99, it’s a steal compared to most Vitamin C products on the high street (which are a lot more expensive). As for reducing or removing my dark spots, I noticed a slight evening of my skin tone and that was it. If you follow me on Twitter, I’m always looking for dark spot remedies so I wasn’t totally satisfied with the outcome but I will continue to use this product. The Superdrug Vitamin C Booster is priced at £4.99 and is available in stores and online. 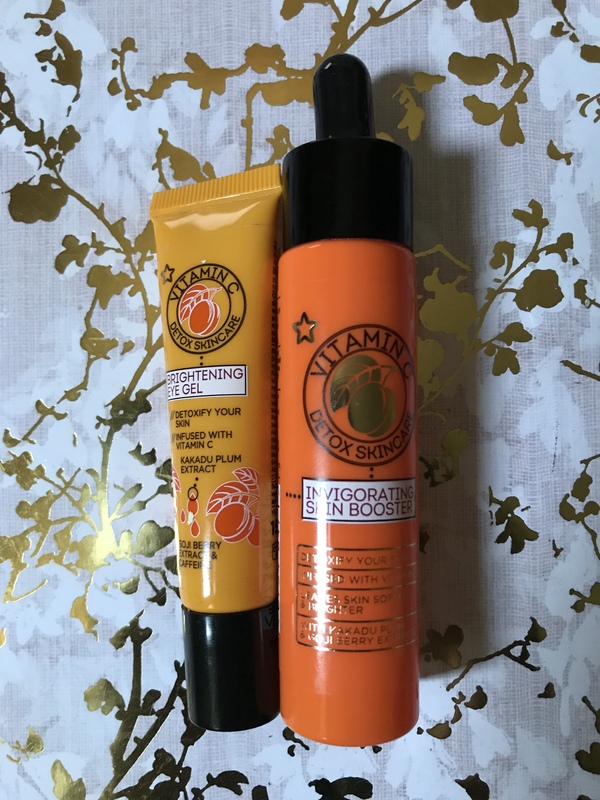 A high street Vitamin C Eye Cream is perfect and I was really excited to try this product. Unfortunately, it hasn’t done anything for me. Superdrug claim on their website that it will detoxify the skin but the reason why I bought this product was for the ‘brightening’ claim which is very clear to see on the packaging. My eyes are quite puffy right now and it hasn’t reduced them significantly. I like the roll on applicator and the fact that the product absorbs into the skin easily. The Superdrug Vitamin C Eye Cream is priced at £4.99 and is available in stores and online. There is a demand for Vitamin C as a beauty product – it has so many amazing benefits. What concerns me about both products is that Vitamin C isn’t one of the first 6 ingredients (on the booster it’s the 6th and on the eye cream it’s the 18th/19th). I do think Superdrug should label the product as infused with Vitamin C and not Vitamin C. In order for any product to be truly effective, the main ingredient ( in this case, Vitamin C) needs to be one of the first six ingredients listed on the packaging. I think this is definitely a factor as to why I haven’t seen any outstanding results as of yet. If you fancy a quick skincare fix and you don’t have a lot of skincare issues, then these products would be perfect for you. Have you used a Vitamin C product? Would you use a Vitamin C product? As always, I love to hear from you all so feel free to leave a comment. You are welcome hun. I’m always searching for products like this because my dark spots are so stubborn. I’m glad you enjoyed the post. Thank you, will invest in something else. I love it when bloggers share an honest review and honest thoughts and I need a product that can do some heavy duty work and where the featured ingredient is actually a featured ingredient. The featured ingredient needs to be the main one otherwise what’s the point? I’m surprised that Superdrug would do something like this to be honest.